The most primitive foot to walk on land was described by scientists in the release of a report in 2002. It belonged to an animal that lived about 345 million years ago in what is now Scotland. The skeletal remains were the oldest found to date in the fossil record to show bones that had the ability to move on land. Dr Jenny Clack, who studied the specimen, said it illustrated how life on Earth had made the transition from a purely water-borne existence to one in which creatures were able to forage on the shoreline. The fossil was unearthed in 1971 from limestone deposits to the north of Dumbarton. Held at the Hunterian Museum in Glasgow, it was thought to be a fish. Only more recently was the surrounding rock cleared away sufficiently to reveal a creature with legs. One hind limb had a near-complete foot attached with five digits. It was classified as Pederpes finneyae. It was a short-limbed, large-skulled predator, about a metre in length (three feet) and may have had the look of an ungainly crocodile. It was probably quite a sluggish crawler through the swamps in which it lived. The identification helped to close a hole in the early fossil record of a group of creatures called tetrapods - backboned animals with four legs or limbs. The oldest-known tetrapods date to the Devonian period (more than 360 million years ago), but the fossils discovered up to the time of writing were of animals that were clearly all swimmers. These creatures would have scuttled around just under the water. Later tetrapods, from the Upper Carboniferous (about 340 million years ago), were modern-looking amphibian-like animals whose appendages were well-evolved for walking on land. They were true landlubbers. The significance of Pederpes finneyae is that it straddles the two - both in terms of time and in its bone structure. It probably spent time in the water and on land. It had a kind of twist on its bones - an asymmetry that allowed it to bring its feet forwards for walking. Previously, tetrapod feet either pointed up to the sides or backwards as a paddle for swimming. The locomotion in the case of P finneyae is quite different to what went before. Tetrapods were the first animals known to walk the Earth, and are the ancestors of today's mammals, reptiles, amphibians and birds. 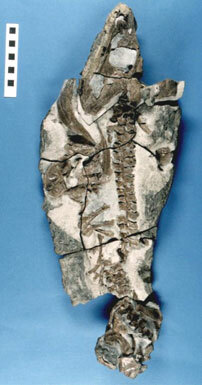 Later tetrapods have a more developed form of this bone construction. This fossil fills in a huge (twenty million-year) gap in the fossil record. It's a link, if you like, which is no longer missing.